The Washington University received some unusual patients to scan: three Egyptian mummies. 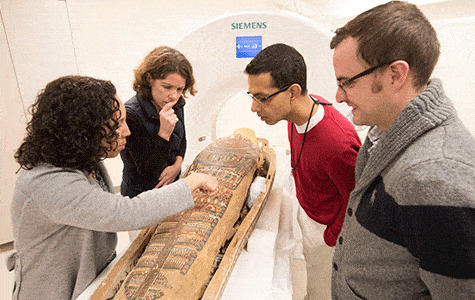 Curators and radiologists examine the mummy of Pet-Menekh on Sunday, Oct. 12, at Washington University Medical Center. From left are Lisa Çakmak, PhD, assistant curator of ancient art at Saint Louis Art Museum; Karen K. Butler, PhD, associate curator of Washington University’s Mildred Lane Kemper Art Museum; Sanjeev Bhalla, MD, professor of radiology and chief of cardiothoracic imaging at the School of Medicine; and Vincent Mellnick, MD, a Washington University radiologist. Pet-Menekh was scanned in a computerized tomography (CT) scanner at the medical center. The scanning took place Sunday, Oct. 12, at the Center for Advanced Medicine on the Medical Campus. 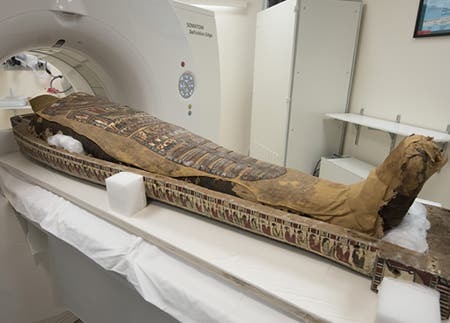 The mummies, two of which are on long-term loan to the Saint Louis Art Museum from the Kemper Art Museum, were scanned using state-of-the-art CT scans. According to Wikipedia, X-ray computed tomography (x-ray CT) is a technology that uses computer-processed x-rays to produce tomographic images (virtual ‘slices’) of specific areas of the scanned object. Basically, CT scans allow you to see “slices” of the inside of a human body without actually having to cut. It’s not the first time this technique has been used for archaeological purposes. The first scan revealed that the mummy still had its brain, heart and lungs; this is pretty unusual, because the heart and the lungs were usually taken out in Ancient Egypt’s mummification. The study also revealed that the mummy had several other objects in its head – but what they are is not clear. It may be something to do with the mummification technique, or it could simply be debris. The second mummy revealed a much more gruesome truth. It appeared to be significantly shorter than the sarcophagus, and researchers quickly observed that it lacked a head. The head was probably removed when grave robbers ransacked his tomb. They found an item on his chest that may have been a burial amulet missed by grave robbers. They plan to reconstruct the item using 3-D printing. Karen K. Butler, PhD, associate curator of the Kemper Art Museum, said Pet-Menekh and Henut-Wedjebu were donated to the university in 1896 by Charles Parsons, a St. Louis banker and prominent art collector. Since then, they pretty much became an important part of the University. 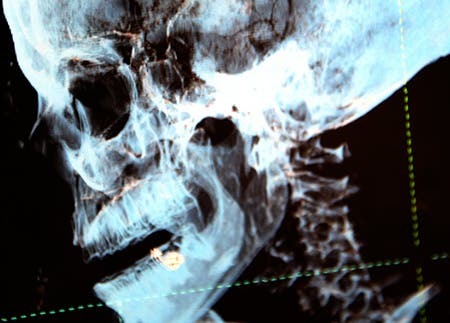 The use of CT scans in mummies has been used for over 20 years but the technology is developing all the time. Now, we are able to study them in much more detail, focusing and zooming in on any points of interest; this wouldn’t have been possible a couple of decades ago – and this is really important. Mummies present archaeologists with an extremely rare opportunity – they are actually time capsules, giving clues of societies and life habits long gone. They can show us not only the life style and spiritual beliefs, but also a number of disease, habits and even general lifestyle. Cutting them open is not an option, as it would not only desecrate the memory of these people, but also possibly destroy unique cultural treasures. This is why non-invasive techniques are used in modern mummy research. For example, an indication of ancient lifestyle is artery hardening. Indicators of heart disease have been detected in prior mummy scans, but it’s not clear yet if this is reflective of the elite lifestyle – that is, if people rich enough to be mummified were more likely to suffer from heart disease. Sanjeev Bhalla, MD, professor of radiology and chief of cardiothoracic imaging lead this study. 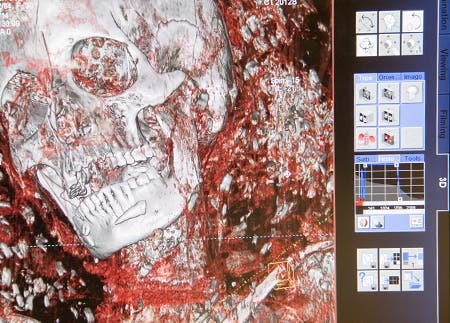 “This new CT scanner has higher spatial resolution and quickly can assemble slices in a variety of ways, providing more medical details about the mummies,” Bhalla said. Logistically, the study was very difficult. They had to be removed from their display cases, and it wasn’t clear if each sarcophagus would fit in the machine, but they ultimately did. Also, there was the problem of being humane. Bhalla viewed this as the most challenging aspect.